It is fittingly called the Fall Classic. Just as summer turns to autumn and the night air begins to chill, baseball rises to a boil fresh from the heat of the pennant races. It never fails to engage, exhilarate, mesmerize and amaze with its drama, unlikely game-changers and unexpected twists. Every play falls under the microscope in the World Series. Every pitch - every sacrifice - every ball that's just foul... Everything and everyone is larger than life. This is the World Series -- the grandest stage for the greatest game. 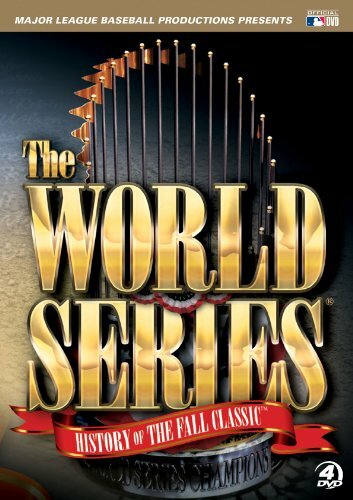 The World Series: History of the Fall Classic vividly captures and comprehensively chronicles the landmark moments from every era of the World Series - as seen through the eyes of those who lived them. Packed with hours of content, and narrated by Bob Costas, this momentous documentary, available in both a two-disc and extras-laden four-disc set, covers the history-making events, the unforgettable moments and the stars of the Fall Classic dating back to its inception in 1903. Overflowing with the madness, triumphs and celebrations of autumn baseball, the program features stunning film footage from the Major League Baseball Film & Video Archives, blended with dynamic digital images bursting with color and extraordinary game sounds captured on wireless microphones. Framed by more than a hundred interviews with World Series players, managers, writers and broadcasters, The World Series: History of the Fall Classic is the definitive World Series retrospective. Major League Baseball Productions is the Emmy award-winning television and video production division of Major League Baseball and the official video archivists of the game. With unparalleled access to the Clubs and their players, Major League Baseball Productions produces original programming for growing audiences worldwide through its network specials, exclusive home videos, commercials and other specialty programming. For more information on Major League Baseball Productions, log on to http://www.mlbproductions.com/ or follow @MLBProductions on Twitter and on Facebook at facebook.com/MLBProd. A+E Networks Home Entertainment, part of the Consumer Products Division of A+E Networks, is a video distributor of non-theatrical programming, featuring collectible DVD and Blu-ray editions of the high quality programming from A&E Network, HISTORY, and Lifetime, as well as acquired classic programming and sports. A+E Networks Home Entertainment brings the best of critically acclaimed entertainment presented in award-winning packaging to the special interest category. A+E Networks Home Entertainment is the official home video partner of Major League Baseball Productions.